Sept. 22 (Bloomberg) -- When Warren Buffett visits Chinese carmaker BYD Co. next week, he’ll find a company facing sliding sales and legal disputes with the government and Foxconn International Holdings Ltd.
Berkshire Hathaway Inc.’s $232 million investment in Shenzhen-based BYD was worth about $2.5 billion last year as the company became the fastest-growing Chinese carmaker. That stake is now valued at about $1.6 billion after BYD’s shares plunged 18 percent this year. Its sales fell 19 percent last month while rivals Dongfeng Motor Group Co., General Motors Co. and SAIC Motor Corp. gained at least 19 percent. BYD chairman Wang Chuanfu also may not deliver electric cars to California this year as promised. The company’s share decline this year compares with a 0.6 percent increase in Hong Kong’s benchmark Hang Seng Index. Buffett, 80, makes his first visit to BYD next week to inspect a plant in Changsha. He will be accompanied by Microsoft Corp. founder Bill Gates to promote philanthropy among wealthy Chinese. The company posted a second-quarter profit of 717 million yuan ($107 million), less than the 962 million-yuan average estimate of four analysts surveyed by Bloomberg. At least nine analysts lowered stock ratings on BYD. The company also slashed its 2010 sales outlook by 25 percent to 600,000 vehicles from 800,000 on Aug. 4. Paul Lin, a BYD spokesman, said last month’s weak sales to dealers stemmed from the company reducing its inventory of unsold cars. BYD relied too much on the compact segment and set overoptimistic sales targets, said Bill Russo, a Beijing-based senior adviser at Booz & Co. The government also raised taxes on cars with small engines, partially reversing incentives that made BYD’s F3 sedan China’s best-selling car in 2009. BYD surged 850 percent after Buffett’s investment and reached a record HK$88.40 on Oct. 23. It closed at $HK56.20 yesterday. Buffett didn’t respond to a request for comment left with his assistant, Debbie Bosanek. MidAmerican Energy Holdings Co., a unit of Berkshire Hathaway, holds 9.9 percent of BYD. The Chinese company was founded in 1995 and made lithium-ion batteries for handsets. Wang bought troubled Xi’an Tsinchuan Auto Co. in 2003. The company will show a new electric bus during Buffett’s visit after introducing the M6 minivan and L3 coupe this summer. Falling prices may further weaken profitability. At a BYD dealership on Shanghai’s Hunan Road, boards advertise cash discounts of up to 12,000 yuan ($1,787) and free gifts for the F3 sedan with a 70,800-yuan sticker price. The company’s third-quarter earnings are “going to look ugly” because of weak sales, said Charles Guo, an analyst at JPMorgan Chase & Co. in Hong Kong. He expects company profit to recover in the fourth quarter as overall car buying picks up. China’s Ministry of Land and Resources is investigating BYD over the illegal use of farmland it agreed to buy in Xi’an from a local economic development agency. The carmaker built factories even though 92 percent of the land they occupied was still zoned for agriculture, the ministry said July 15. The government said it will decide by Sept. 30, the final day of Buffett’s visit, whether to punish the automaker. Lin wouldn’t discuss the potential implications. Foxconn, the maker of Apple Inc. iPhones, accuses BYD of stealing trade secrets. That helped BYD, China’s biggest rechargeable-battery maker, double revenue from its handset business from 2005 through 2007, Foxconn said in court documents. BYD countersued, claiming that Foxconn gathered false evidence and conspired to injure its business. Terry Gou, chairman of Foxconn Technology Group, criticized Buffett’s purchase of BYD shares in a Bloomberg Businessweek interview. Analysts also are re-evaluating BYD’s electric-vehicle strategy. The carmaker likely won’t deliver its E6 model to the U.S. before the second half of 2011, said Scott Laprise, a Beijing-based analyst at CLSA Asia Pacific. Lin said BYD still plans to ship the cars to California this year. BYD last year delivered 48 of its F3DM plug-in hybrid cars selling for 149,800 yuan each. The company declined to give 2010 sales figures. Still, BYD’s strength in batteries may pay off for investors, Casesa said. China, the world’s biggest polluter, offers subsidies for cars powered by electricity. China is paying as much as 50,000 yuan toward the purchase of plug-in hybrid models and up to 60,000 yuan for vehicles running only on batteries in Shanghai, Changchun, Shenzhen, Hangzhou and Hefei. --Liza Lin. With assistance from Andrew Frye in New York and Tim Culpan in Taipei. Editors: Ian Rowley, Michael Tighe. 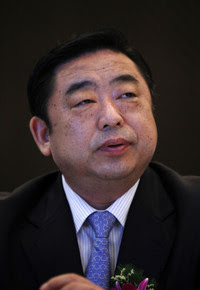 Hu Maoyuan, chairman of Shanghai Automotive Industry Corp. (SAIC). SAIC Motor Corp. said it may invest in the initial public offering of partner General Motors Co., cementing ties between the biggest U.S. and Chinese automakers. China’s largest carmaker will consider investing in GM if “conditions are favorable,” Chairman Hu Maoyuan said in Shanghai yesterday. The company hasn’t yet made a decision whether to make the investment and is waiting for the details of the share sale, he said yesterday. The automakers, which have made cars together in China for more than a decade, said in December they would also sell low- cost vehicles in India. GM filed for an IPO in August as the U.S. government seeks to pare the 61 percent stake it gained in the company through its bankruptcy and $50 billion taxpayer bailout last year. SAIC’s Shanghai-listed shares rose as much as 3.4 percent today to 17.52 yuan and changed hands for 17.41 yuan as of 10:51 a.m. The benchmark Shanghai Composite Index gained 0.1 percent. GM’s initial public offering will be open to overseas investors, the U.S. Treasury said in a statement on its website. Retail and institutional investors will be offered shares, and the Treasury “will not involve itself in decisions regarding allocation of shares to specific buyers,” the department said. China’s wholesale deliveries of passenger cars increased 18.7 percent to 1.02 million units in August, compared with 13.6 percent growth in July, the China Association of Automobile Manufacturers said in an e-mailed statement on Sept. 9. Sales in markets such as China and India are helping offset slumping demand in the U.S. and Europe. China, which overtook the U.S. as the world’s largest auto market last year, may sell 16 million vehicles this year, the association said last month, boosting its forecast from a previous estimate of 15 million. The carmaker is “in great shape” to hold an offering, United Auto Workers President Bob Kingsaid in a Bloomberg Television interview. GM, China’s largest foreign carmaker, makes vehicles including Buick Excelle and Regal cars as well as Chevrolet Lova compacts with its Chinese joint-venture partner SAIC Motor Co. It also makes Sunshine minivans at SAIC-GM-Wuling Automotive Co., a venture with SAIC in which it owns 34 percent. In December, GM and SAIC signed an agreement to invest $650 million to form an equally-controlled venture to sell cars in India. The American automaker plans to spend $250 million in introducing five SAIC models in Asia’s second most populous nation, Karl Slym, president of GM’s Indian unit said in July. To contact the reporters on this story: Liza Lin in Shanghai at llin15@bloomberg.net. The Chinese auto market makes a habit of defying even the most optimistic of predictions. But when a Chinese government official warned recently that head-long investment by the car industry would leave China with a big overcapacity problem by 2015 – when capacity reaches 31m vehicles per year – he touched off a fierce debate over whether the domestic market can absorb all those cars or whether some will be dumped cheaply on world markets. Serious overcapacity will lead to negative market competitiveness, a loss in enterprise efficiency, factory stoppages and other problems,” Chen Bin, a top official at the National Development and Reform Commission (NDRC), China’s economic planning agency, said recently. A Chinese car industry producing 31m vehicles would be nearly twice the size of the current domestic market – estimated at 16m-17m this year – and well over double the current US market. Charlene Barshefsky, former US trade representative, predicts a new trade war in the making. “The glut will be destined for export and that will increase trade tensions,” she told a car industry conference in the Chinese city of Chengdu last week. But Chinese carmakers dispute the very notion of overcapacity. “We believe the domestic market demand will reach 25m units [by 2015] and therefore annual capacity of 30m should not be considered too much,” the China Association of Automobile Manufacturers said. The problem for many of the leading carmakers at the moment is not excess capacity, but lack of it, says Mike Dunne of Dunne & Co, an Asian car consultancy. “The top 10 carmakers, with 90 per cent of the market, are short of capacity,” he says. Ivo Naumann, of motor industry advisers AlixPartners in Shanghai, says the overcapacity numbers may be exaggerated, since they are based on often inflated projections from car companies themselves. And even if all that capacity eventually materialises, it is far from clear that the market will be too weak to absorb it. “The NDRC warned about overcapacity in 2006, but they were proved wrong,” says Yang Jian, editor of Automotive News China. “The capacity problem will be solved over time,” says Bill Russo of Synergistics, a Beijing auto consultancy, and former head of Chrysler in China. He says the problem is not total capacity, but which companies are building the new factories: Chinese car companies are adding capacity much more quickly than their stronger foreign rivals. “Local brands are adding capacity in the belief that they can capture half the market by 2015,” says Mr Russo, up from 30 per cent now. “However, this is proving quite difficult since Chinese consumers are typically not loyal to Chinese brands,” he adds. The Chinese government is not just worried about excess capacity. It has also struggled for years to force the consolidation of the highly fragmented car market, which Mr Russo says comprises 120 vehicle manufacturers. Beijing has called for the formation of four large state-owned national “champions” producing 2m vehicles per year each, and four more companies producing 1m each. But in such a strong car market – Chinese sales rose 46 per cent last year – there is little incentive to consolidate. “It’s difficult to get any kind of consolidation in the face of tremendous growth in this market,” says Mr Russo.